The state of Republicans and their party has been very much in focus this year, with a large field of presidential candidates battling it out in a series of debates and continuing divides among Republican lawmakers on Capitol Hill that led to a change in their leadership. 1 Republican voters give the current field of presidential candidates higher ratings than at comparable times in the past two nomination contests. Nearly six-in-ten Republican and Republican-leaning voters (59%) say they have an excellent or good impression of their party’s hopefuls, according to a September survey. In August 2011, half (49%) of Republican voters viewed the GOP presidential field positively; in October 2007, it was similar (50%). 2A majority of Republicans want a candidate with “new ideas” rather than experience and a proven record. About two-thirds (65%) of GOP voters held this view when asked in September. This number surged since March, when 36% said having new ideas was more important, compared with 57% who preferred an experienced candidate. 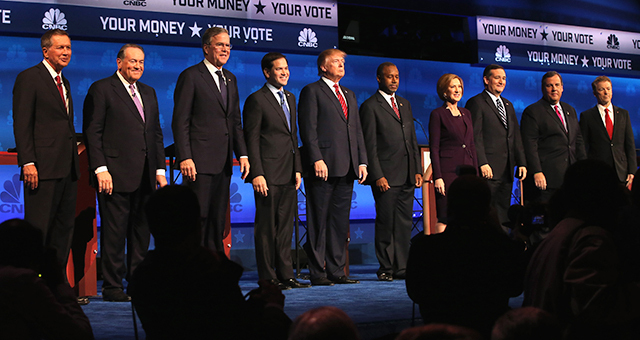 The data suggest that Republicans are more open to a candidate who’s new to politics. A mid-October Wall Street Journal/NBC News poll found that 57% of Republican primary voters are enthusiastic about or comfortable with a person who is not a politician. That poll found the opposite to be true among non-Republican primary voters – 76% have reservations or are uncomfortable with a lack of experience. 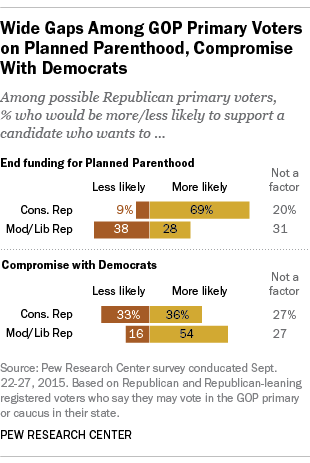 3Republicans still overwhelmingly oppose Obamacare and the Iran nuclear agreement. About six-in-ten Republicans (61%) favor scrapping the Affordable Care Act, a far greater share than among the overall public, according to a Kaiser Family Foundation survey conducted in mid-October. Another 18% say Congress should scale back what it does, 5% want the law implemented and 8% would like to see it expanded. Among all Americans, there’s far less support for repealing the law (32%), and more than a quarter of the public (28%) wants to see it expanded. Republicans also are not fans of Obama’s Iran deal. Roughly seven-in-ten possible Republican primary voters (69%) said in September that they would be more likely to vote for a candidate who would scrap the Iran nuclear deal. Conservative Republicans are more likely than moderate-liberal ones to hold this view, but at least half in both wings of the party want a candidate who opposes the agreement (74% and 56% respectively). 5The Republican Party continues to be seen less favorably by the public than the Democratic Party. In our July survey, just 32% overall had a favorable impression of the Republican Party, while 60% held an unfavorable view. The Democratic edge over the Republicans had narrowed after the GOP’s midterm election victory in 2014, but the gap now is as wide as it has been in more than two years. 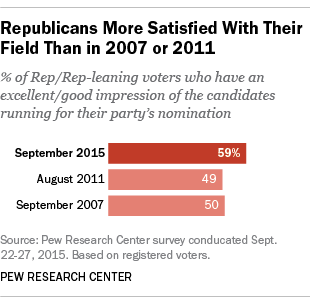 Republicans, in particular, have become more critical of their own party. The percentage of those holding a favorable view fell to 68%, the lowest share in more than two years. In May, just 37% of Republicans said GOP leaders on Capitol Hill were keeping their campaign promises. Note: This is an update of a post originally published on Mar. 7, 2014.